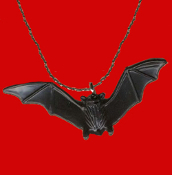 BLACK BAT PENDANT AMULET NECKLACE - Halloween Twilight Vampire Goth Plastic Dracula Symbol Scary Charm with Outspread Wings. Cool classic gothic accessory for Halloween Costume Party or Vampire Collector. Dimensional, detailed miniature charm, approx. 1-inch tall x 2-3/8-inch wide on 18-inch Neckchain with safety clasp.